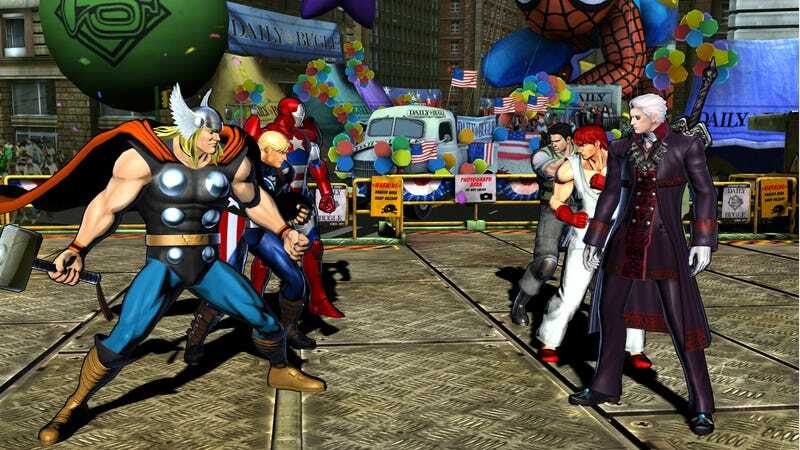 Now that Marvel Vs. Capcom 3: Fate of Two Worlds is on store shelves, Capcom can start doling out the downloadable costume packs. Check out upcoming costume changes for Captain America, Iron Man, Dante, Thor, Chris Redfield, and Ryu. The first batch of download costumes for Marvel Vs. Capcom 3 hits on March 1, the same day the game's AI-battling Shadow Mode makes its debut. For a mere 400 Microsoft points (or $4.99 on the PlayStation 3), fans can secure Captain America's alter-ego Steve Rogers in his super soldier duds, Thor's classic Kirby look, and Norman Osborn's red, white, and blue Iron Patriot costume on the Marvel side. Capcom's side of the costume pack sees Dante dressing up like his dad, Ryu sport his original Street Fighter clothes, and another look for Resident Evil's Chris Redfield. I'm still missing the days when alternate costumes were unlockables and not purchasables, but this is still a pretty fancy wardrobe change. Who's buying?